I used to think that buying a duvet was a simple task. It isn't as easy as it may first seem. That is why I have put together what I call the "Ultimate Duvet Buying Guide." If you have the time to read this, then you will know anything and everything there is to know. In turn that will help you make a much better buying decision. This article is dedicated to duvets and duvet covers. 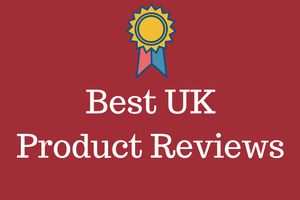 We might throw in some information about our favourite pillows from time to time, but in the main we stick with reviewing the best duvets in the UK Market place. When you make up a bed most people will have a sheet on top of a mattress. Once that is done, then you have the choice of a top sheet and blankets or if you prefer a duvet. It really is a matter of choice as to which you prefer. A duvet basically replaces the need for blankets on a bed. A duvet is some type of cotton or polyester sheet like material that can be stuffed with either natural feathers/down or with synthetic fibres. The covering is usually given a thread count. A thread count measures the number of horizontal and vertical threads in one square inch of fabric. So why is that important? Thread count in bed sheets can vary quite a bit from as low as 60 and all the way up to 800. The most popular bed sheets range from around 180 to 350 thread count. To keep things simple, the higher the thread count, the softer the sheets or cover will feel. When it comes to duvets this is not that important as most people will buy a duvet cover, to match in with their decor. That cover will then be pulled over the duvet. We will look at fillings in more detail later. For now though, depending on the filling, the duvet is then given a tog rating which I have explained below. Duvets are used in bedrooms all over the UK and in almost every Hotel, guest house and B&B. They are very popular indeed. The filling is stitched inside the duvet, and this stitching can be done in a number of ways. Some manufacturers use what is called long channel stitching and others use smaller box stitching. Why is that important? One known problem with some duvets, is that the filling can move inside the duvet. When long channel stitching is used, the filling can start to fall to the bottom of the duvet. This type of stitching makes the duvet look like a set of long tubes sitting side by side. So instead of it being uniformly spread across the entire duvet, the filling drops to the bottom, and that makes the duvet slide off the bottom of the bed. Now it will seldom actually fall off the bed, but it means you have to keep pulling the duvet up and over you. That can get really annoying. The square type stitching, often referred to as box stitching, is in my opinion a better job. The filling inside is contained within the stitched squares and as such has little room to move about. As you would imagine the square stitching involves more work from the manufacturer, and as such, will normally cost a little bit more. Which Brands Make Duvets in the UK? As you can see there are quite a lot of these. 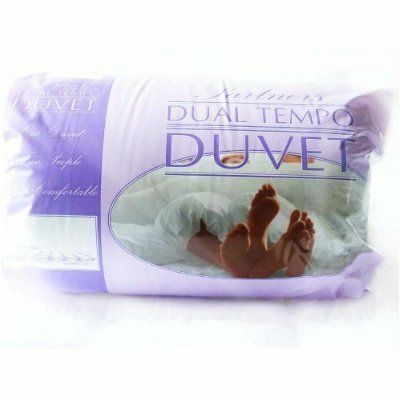 You can buy duvets in the UK in a whole range of stores such as Debenhams, John Lewis, TK Maxx, Marks and Spencer. Argos, Dunelm and Tesco. You can also buy them online at Amazon and other online stores. How Much Do Duvets Cost? 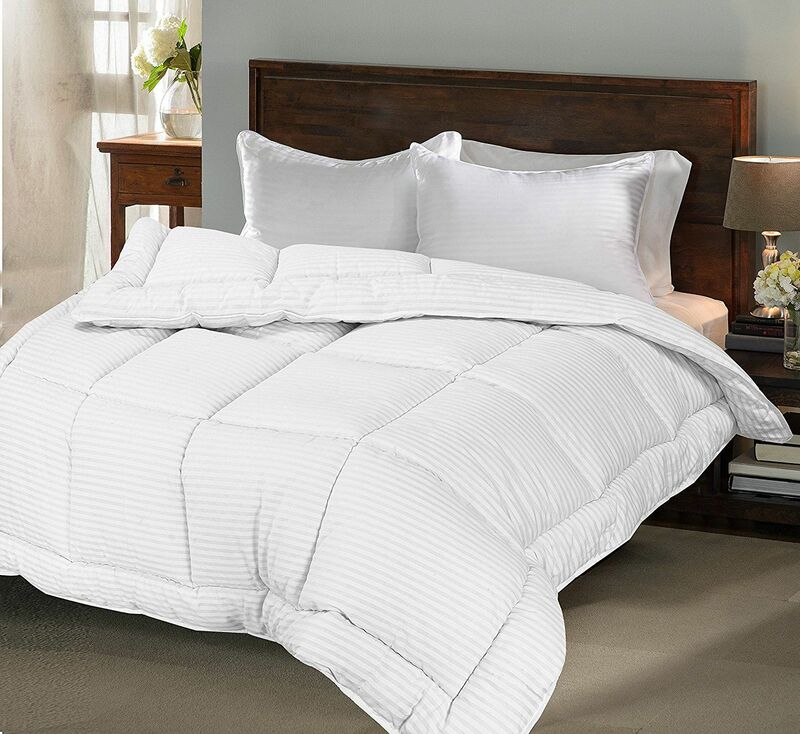 The price varies depending on the size and quality of the duvet that you want to buy. Generally speaking they vary from £10 -50 with a good quality one costing around £25. So as you can see they are an affordable item. 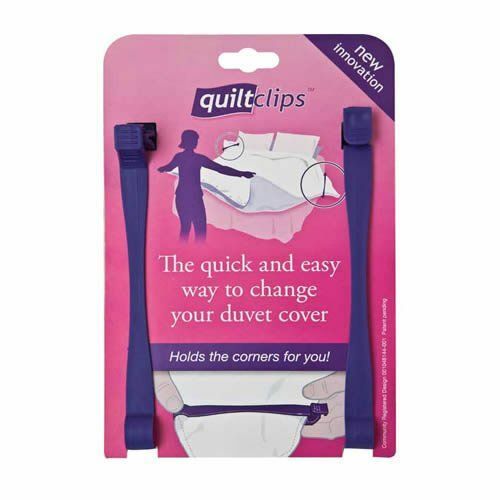 You may also want to buy a duvet protector and almost certainly want to buy a duvet cover, for decorating your bedroom. As good a place to start as any, is the size of the bed that you want the duvet for. There are a few different bed sizes available in the UK as I am sure you know. Let's have a closer look at those. 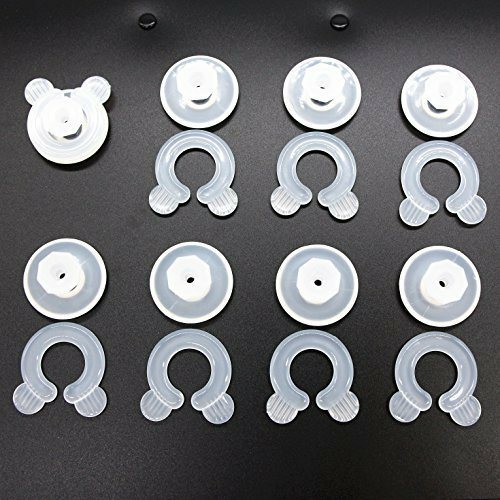 Please note carefully that the ones shown below are those used by UK manufacturers and are the most common sizes. I remember when I first came across this term, I found just a strange thing to say. The tog rating refers to the effectiveness of the thermal insulation of a material. To get slightly technical for a moment, a tog is the measurement used on items like duvets and carpet underlay. The actual word comes from the Roman word "toga" which is a Roman garment. The tog rating actually refers to the duvet filling. It measures its ability to trap air and as such provide more warmth. Now I do understand that some people are naturally warm, and for many this type of temperature is ideal. If you have poor circulation, or generally a cooler body temperature, then the duvet and your natural body heat will regulate the temperature for you. It may just take a little bit longer. Pick a tog rating that suits the average temperature of the room as shown below. Now you will notice some overlap with these tog ratings vs air temperature. That is because we all like different temperatures to sleep in. Some people prefer a cooler bed, whereas, others like to be nice and warm. 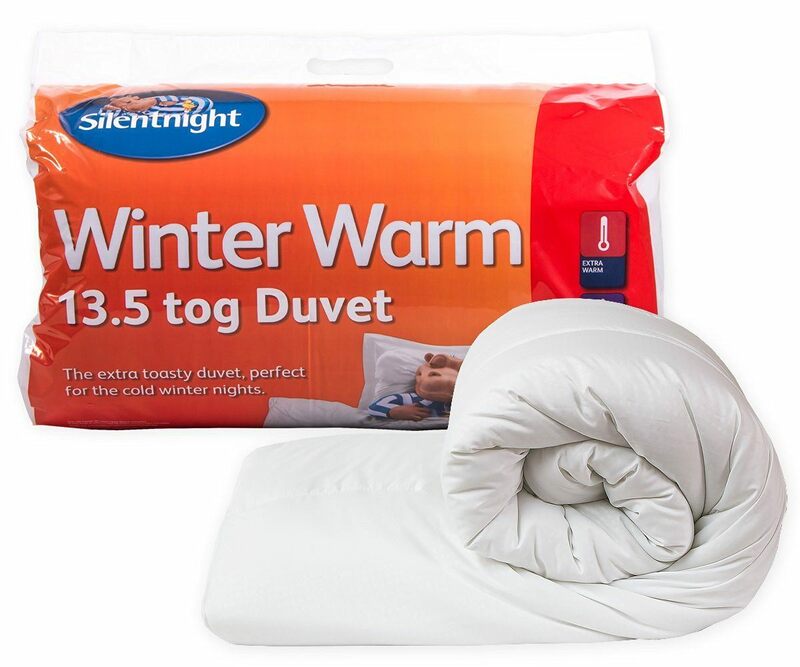 In the simplest of terms most homes will use a lighter tog duvet in the hotter summer months, and use a winter tog rating when it starts to get cold in the UK. The area that you live in the UK will also determine the air temperature. Those living in Scotland, Northern Ireland and the North of England will have colder temperatures than those in the Southern parts of England. The way that you heat your home will also impact a lot on the air temperature in the bedroom. Also things like leaving a window open for fresh air will also impact the air temperature in the room. 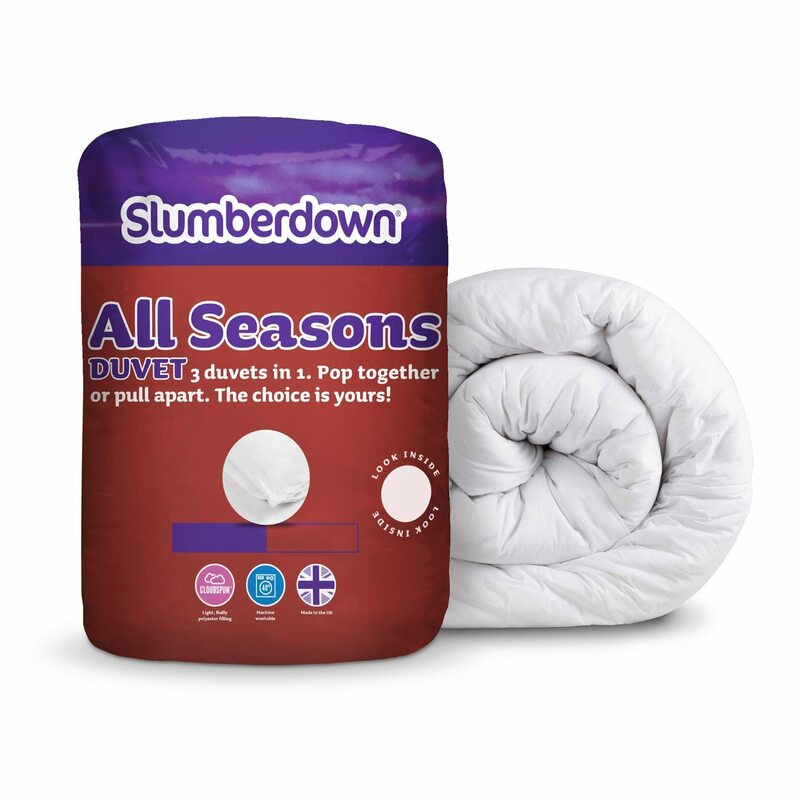 Many homes simply buy a tog rated duvet of 10.5 and use that all year round. As I mentioned there are quite a number of variables so only you will know which system works best for you. Personally I use a light tog in the months May through to September and then change to a 10.5, for most of the other months. If there is a really cold snap I go for the heavier 13.5-15 tog rated option. Primarily the type of filling you pick will mainly come down to how much you can afford to pay, and also if anyone suffers from allergies. Natural fillings are considered to be better but also more expensive. Duvets are either filled with natural materials or with synthetic materials. Another key point to consider is allergies. If you or anyone in your family suffers from allergies, then avoid natural materials. Synthetic is the only real option here, and these are made to be non-allergenic. That makes them safe for everyone. Natural materials are considered more luxurious, trap heat better and have higher levels of warmth. The type of material we are talking about here is either feathers or down (goose or duck breast feathers). In almost all cases these types of filled duvets will be thinner yet heavier than an equivalent synthetic duvet at the same tog rating. When you first buy your duvet and take it out of the packaging, it will be, or should be fluffy, bouncy and really cosy. The test of a good duvet, in terms of quality, is that it stays that way. Some people refer to this as the bounce of the duvet. In other words does it retain its shape after months of use? That is always something to check on when you are reading up on any reviews. Which Size Duvet to Buy? So if you know the size of your bed, then simple purchase a duvet made for that bed size and you will be fine. If you don't know the size of your bed, then you will have to measure it. Most people simply measure the mattress size and then buy the duvet to suit the mattress. Which Duvet is Best for Children? The maximum tog rating for any child's bed should never be higher than 10.5 tog rating. 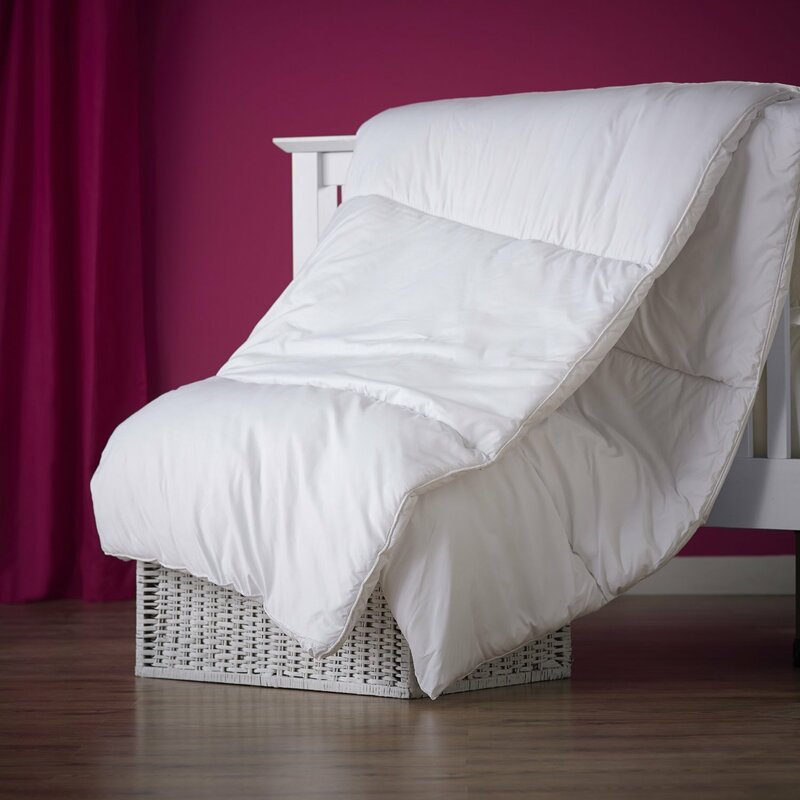 Children are smaller and as such an adult size duvet would trap more air around their smaller frame. That would mean they could easily over heat. The majority of people buy a 7.5 tog rating duvet for their kids and that is ideal. Babies should be using special cot blankets and quilts and not duvets. They are absolutely not suitable for babies under 12 months. The British Standard's Authority have written a full explanation of this, which you can read by clicking here. This is the best selling one on Amazon UK. 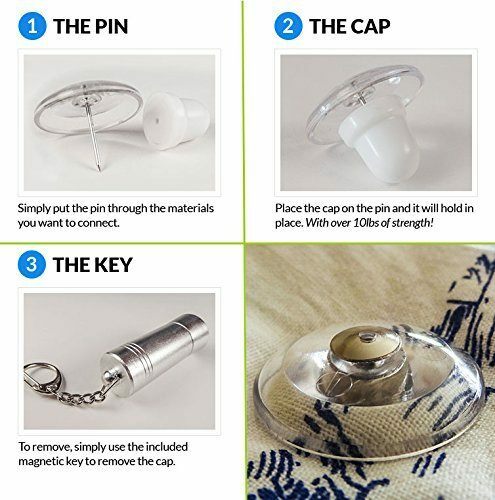 It is from the Slumberdown brand. You can get this one in 4.5, 10,5, 13.5 and 15 tog ratings. The sizes available are for single, double and king sized beds. As you can see from the image, this is a very nice looking duvet. 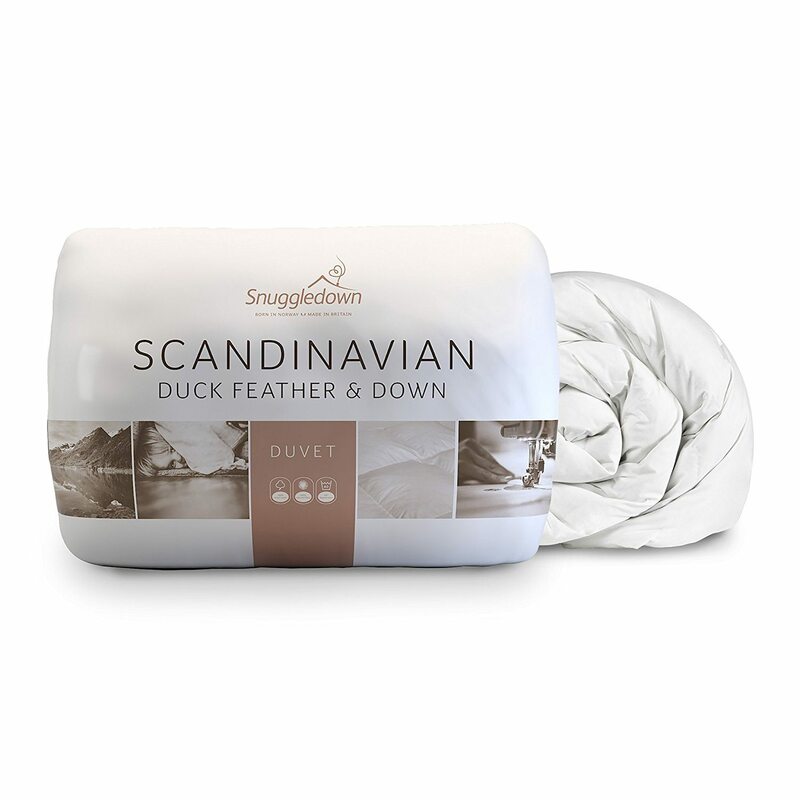 Packed with luxury goose feathers, and with the tight box stitching, this is a high end cotton duvet. 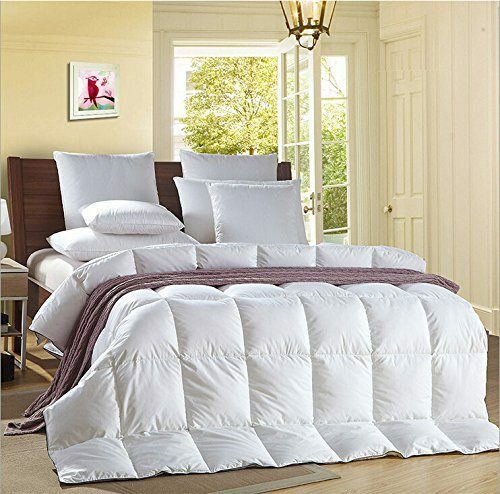 It is finished in a 100% Cotton cambric feather-proof cover that keeps the feathers inside the quilt. It has a very good 230 thread Count. It is also suitable for people who suffer from house dust allergies. Buyers do rave about this duvet from the Silentnight brand. This is a mid-range style of duvet, that is suitable for use in the Spring and Autumn. The cover is made from polycotton. It is filled with high quality hollowfiber. The good news is that it is machine washable, and also comes with 5 year guarantee. It is made from 60% Polyester / 40% Cotton with the filling being 100% Polyester. As such is is a hollow fibre, and includes the duvet and quilt. 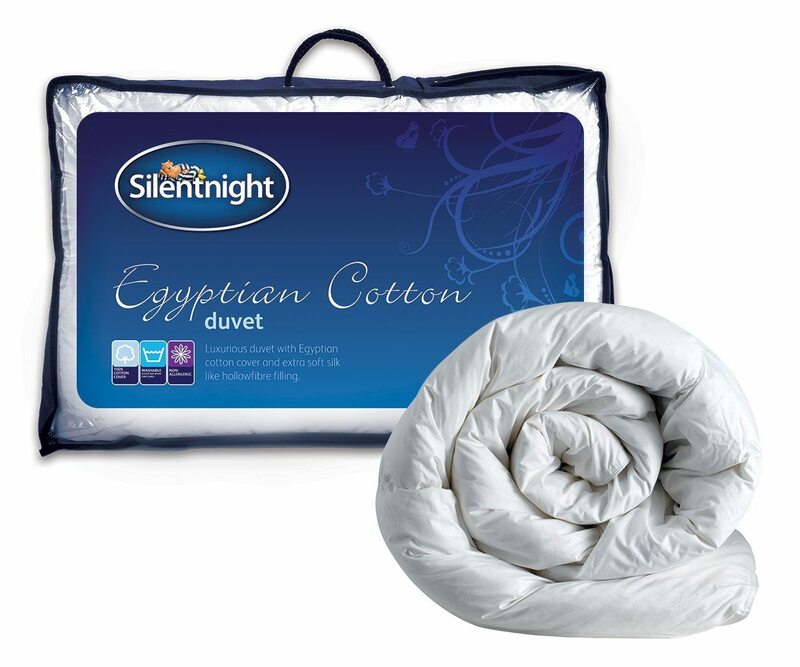 Another very popular choice from the Silentnight brand. As the name would suggest this is the sort of duvet, you will want on your bed, when the icy cold winter nights arrive. This duvet is machine washable and comes with a 5 year guarantee. Do you want the luxury of Egyptian cotton? These are used by leading hotels all over the world. Why not bring that luxury into your own home? 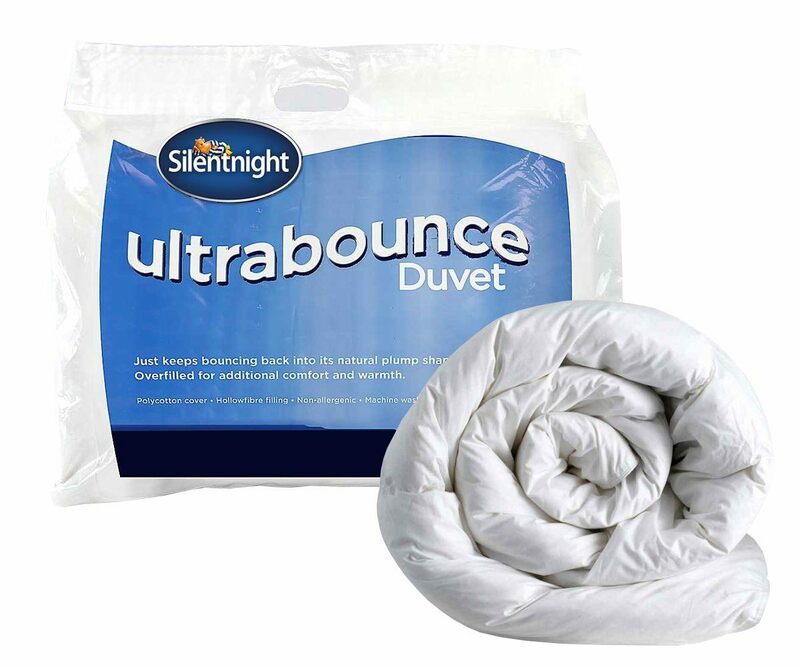 Like most of the Silentnight range, this one is also machine washable and comes with their 5-year guarantee. 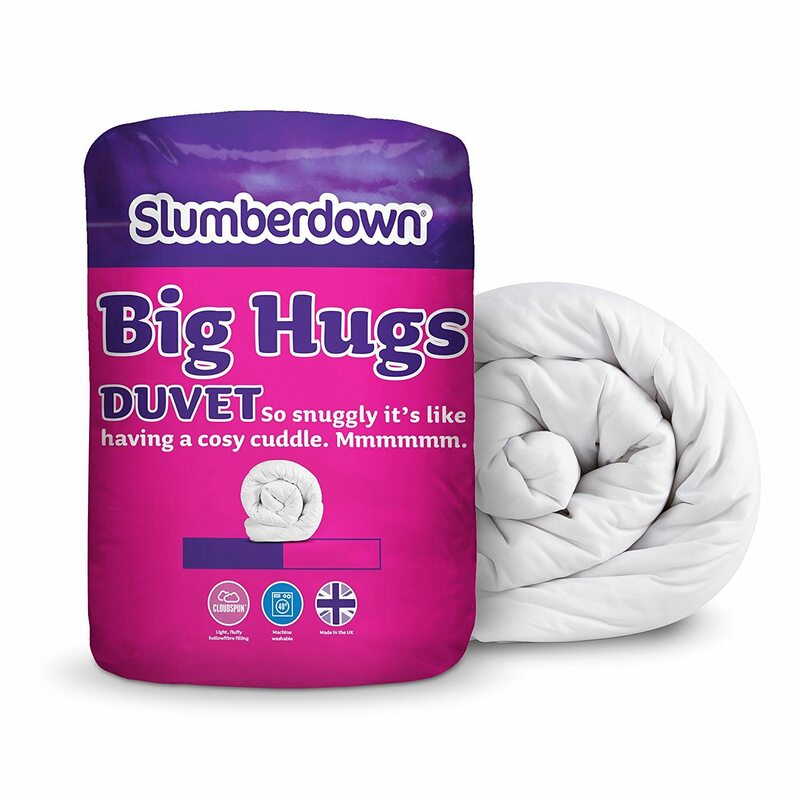 Buyers really love this duvet, and hence the full 5 star ratings. 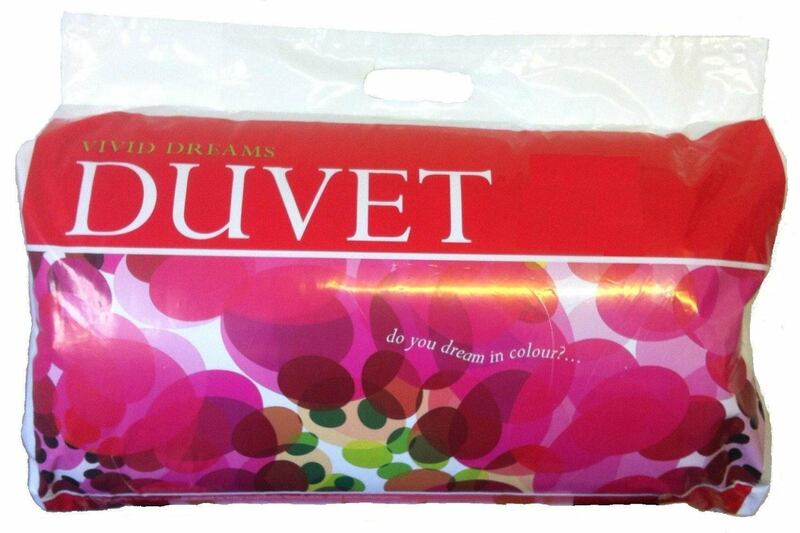 Despite the name, this duvet is actually made in the UK. It is the higher end duck feather and down duvet, so luxury at its best. A clever idea here. This is a 3 in 1 duvet. It comes as a 1 x 10.5 tog and also as a 1 x 4.5 tog. So you can use each separately or combine them depending on the time of year. You use the 4.5 tog for keeping cool on warm summer nights, the 10.5 tog on milder nights. When winter kicks in use them both together. if you have slept in a 5 star hotel, then you will already know about the high quality of their duvets. Why not enjoy that at home? This comes with box style stitching, a hollow fibre filling and perfect for allergy sufferers. Resolve marital disputes the easy way. How about a duvet that splits right down the middle. 4 tog one side for mor or mrs cold and 7 tog on the other for mr or mrs hottie. Duvets should be washed and cleaned every 6 months and at least annually. I would strongly suggest that before doing this to check the item’s care label and follow the suggested washing instructions. Many duvet manufacturers will recommend taking the item to a professional dry cleaner. You can do this at home but to be honest most people will not have a big enough washing machine. The cheapest way to clean your duvet, if your washing machine is too small, is to take it to a launderette. For around £3-4 you will be able to use one of their bigger machines, though the time taken will be about an hour. The average cost to get your duvet dry cleaned is around £8-10. In many cases it can actually be cheaper to buy a new one, which is madness. However that is the way that it works. If you have bought an expensive duvet, it is certainly worth having it dry cleaned once or twice a year. If you bought a cheap one, it really is as easy to buy another one after 6-12 months or so. How to wash a duvet with synthetic fillings? Duvets with synthetic fillings can usually be washed at home. The sad reality is that the huge majority of domestic washing machines do not have a large enough capacity to allow the duvet to move around freely in the drum. If you do have a big enough machine, then use a gentle cycle, with minimum agitation, and a normal spin setting. When finished make sure it is completely dried and aired before using it again. When you open up your new duvet, you will know that it has come in a box. Inside that it will probably be wrapped in some type of plastic. You do need to really shake this out before putting it on the bed. Not only do you need to shake it out, but you need to leave it for a couple of hours, to let the fibres expand out. Quite often when first out of the box, the duvet can look much flatter than you expected. Give it a couple of hours after you have shaken it out, and you will notice a big difference.